The BJP has pulled a huge surprise, overlooking Ananth Kumar’s widow who had already begun campaigning in the constituency. 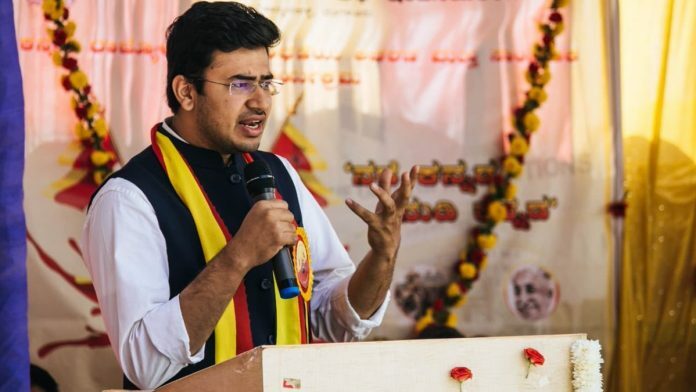 Bengaluru: The Bharatiya Janata Party (BJP) has sprung a big surprise in announcing its Yuva Morcha leader, lawyer Tejasvi Surya, 28, as its candidate for the high-profile Bengaluru South Lok Sabha constituency. What appeared to be a sure shot ticket for Tejaswini Ananth Kumar, the widow of former union minister Ananth Kumar, has been turned on its head with the BJP deciding to go with a new face. Before his death on 12 November 2018, Kumar had never lost a Parliamentary election here since 1996. There is now major deliberation as to why the BJP would overlook Tejaswini for the young lawyer. ThePrint explains. The lawyer, who practises in the Karnataka High Court, is the general secretary of the BJP Yuva Morcha in Karnataka and is a part of the party’s national social media team. He is also a regular presence in most debates on the BJP in the South. Known to be a fiery orator, Surya is wildly popular on social media. He has, for instance, 57.1k followers on Twitter. An active member of the Akhil Bharatiya Vidyarthi Parishad (ABVP), Surya runs the NGO ‘Arise India’, which aims to create a young vibrant vote-bank for the BJP. Away from social media, Surya was among the BJP leaders behind the ‘Mangalore Chalo’ rally in September 2017, which saw BJP members make their way from Bengaluru to Mangaluru to protest the alleged killing of RSS workers in the Dakshina Kannada region. The rally was credited for the BJP’s near clean sweep of the region in the 2018 assembly elections — the party won 12 of the 13 seats in Dakshina Kannada. Unlike what his backers claim, Surya is no ordinary party worker. He hails from a family of BJP leaders and is the nephew of the Basavangudi MLA Ravi Subramanya. The party appears to have stuck with him in a bid to connect with younger and first-time voters. There is also a perception in the BJP that Tejaswini Ananth Kumar just didn’t do enough to secure the ticket. The former union minister’s wife had the backing of state BJP president B.S. Yeddyurappa, who had publicly declared her candidature. Tejaswini had even begun campaigning in the constituency but had to wait too file her nomination as the party high command had delayed announcing its candidate for the seat. She had even tweeted photographs of BJP workers at her residence Monday, a day before the announcement. Today hundreds of our anxious well wishers & BJP karyakartas visited our house. Nation First, Party Next, I Last. But party insiders say that a major reason her name was dropped was that she has never made any major contribution to the BJP apart from assisting her husband. Her influence among voters has also been questioned. Sources also said that B.L. Santosh, the national joint organising secretary of the RSS, who was also in the running for the ticket, had impressed upon the BJP high command that while Ananth Kumar was a life-long RSS karyakarta, his wife had not worked up the ranks as he had. Another reason for her name being dropped is that the BJP is not keen on promoting dynasty politics, particularly when it has been targeting the Congress and the JD(S) over it. A senior political leader in the party confirmed that Tejaswini’s name was dropped to send a message that the BJP does not believe in dynasty rule, unlike its opponents. Even though Surya hails from a family of BJP leaders, backing Tejaswini, who is a direct relative, may hamper the BJP’s narrative, sources said.